The truth is, we can’t always give them attention, especially if you are busy with something important. Installing this product in your home, it will provide your pet free access to your home. You no longer have to be his doorman. 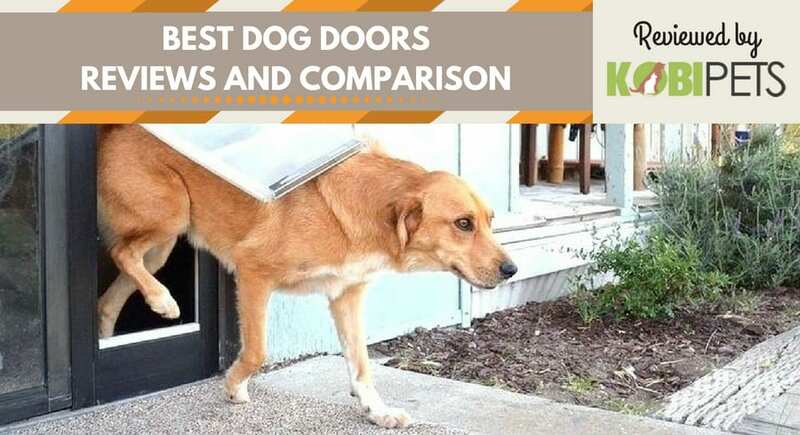 Because there are many different types, we singled out the list of best dog doors, that will help you find the right door for your furry friend. Patio Pacific is a wall mounted door with a unique Endura flap design. It is very durable with the particular construction for all types of climates and weather. So if you are looking for a product that will last you a very long time, then this door are the perfect choice for you. It provides high wind resistance, and it’s super energy efficient. Large –Single Flap : 10 x 19 inches. It is available with double and single environment-friendly door flap that are sealed with magnets. If you are living in a harsher climate, we recommend to take the version with a double door. Its good insulation will trap the air inside the two layers. It is very flexible, so it won’t crack or break in the heavy weather condition. It is made from an aluminum steel frame that’s lightweight and very safe for our furry friends. When your dog is not using this door, you can lock it easily and quickly unlock it when it’s needed. You are choosing what is best for your pet and what size will accommodate him. Putting it together is difficult, and it takes time. It is also not easy to follow the installation instructions. It will go great with your condo or apartment. It includes shutter resistant, safety tempered glass, which will keep it from breaking. It has a specially designed aluminum frame with the energy efficient system and the flexible flap door, sealed with the magnetic closure. Its insulating system will conserve the energy and keep the cold and heat outside. It will fit both the right and the left sliding glass door. It features a closing panel, that will allow you to lock it when it’s not in use, and unlock it when your pet is ready to take over the yard. It is easy to assemble, especially with its installation hardware and detailed instruction. It is available in three different colors: bronze, white, and satin. Be careful with the installation. Some costumers have complained that it does not fit properly with the some sliding doors. If you are looking for a good purchase, then you have found your product. This product is not expensive, and it will provide your dog access to exciting new freedom. So it is a great deal for you and your furry friend. Because of its unique design, it is very easy to install. 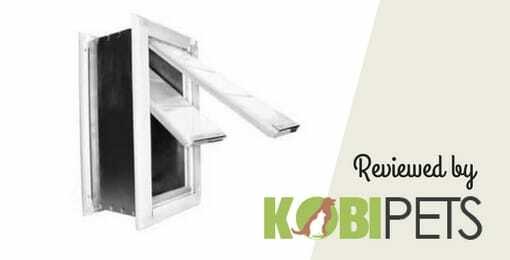 It has a telescoping tunnel that will help you adjust it in any exterior or interior wall in your home. The aluminum frame will ensure its lightweight, but it will also guarantee durability and strength to the door. Telescoping tunnel dimensions are 2 x 4 and 2 x 6 inches. It can be used by dogs up to 100 pounds. Product dimensions are 8 x 13 x 18 inches and 8 pounds. It features the super insulation system. The double flap scheme has adjustable magnets that will secure the door. It is designed to protect your home from the harsh weather conditions. 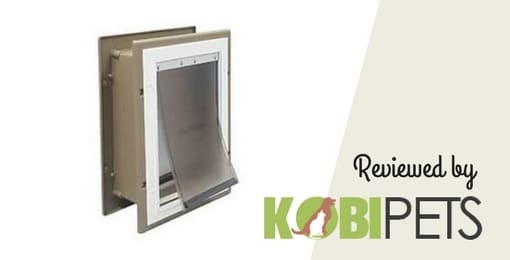 With its non-rusting closing panel, you can easily lock this door up when you need your pet to stay indoor or outdoor. This product comes with an installation instruction and screws that will hold the door to the wall. Pay attention to the product when you open the package. Some users have complained about getting this item with some flaws and plastic parts. If it’s confirmed by experts, it is also approved by us. We highly recommend this product for places where the temperatures are high or very low. It is made from foam molded plastic with an insulated flap system, that is made of vinyl. It will prevent high heat during summer time and also cold weather from coming in. 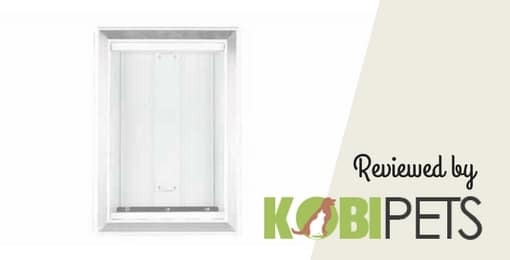 With this products air pocket that acts as insulation, you will easily save your energy. It is lightweight and yet very durable and sturdy. We all want for our pets to be safe and free at the same time. With this product, you will provide this for your precious furry friends. 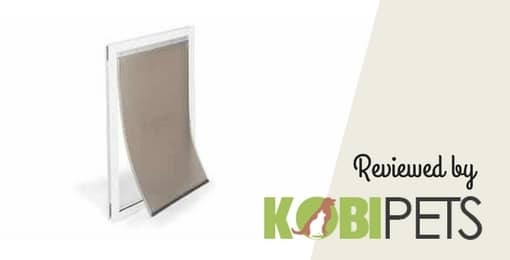 It includes an inner telescopic frame that will protect your dog from sharp or irregular surfaces. It can be used by pets up to 120 pounds. That gives this product a super advantage. It’s not difficult to install this product. The instructions come with the product, so make sure to follow them correctly. The metal weight at the bottom of the door will keep them closed when your pet is not using them. There is a small flaw with the magnets. There were complaints that they are fragile and will not hold a larger door. These dog doors are perfect for those who are short on budget and yet want something classy and modern. This product is perfect for your pet and you. Even though it’s made of plastic, it doesn’t look cheap at all. It will come as a modern feature to your home. 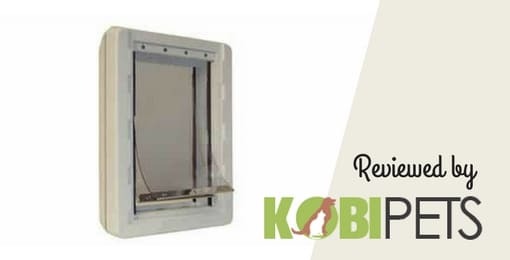 Made of white plastic and aluminum lining, this door will provide your pet a key to an exciting life of freedom. The plastic is made with durable quality, and it is hard to break. Even if your dog is super active and very playful. It is suitable for pets up to 100 pounds. The construction is strong and safe. It will prevent from entering some unwanted guests. It includes a flexible flap, made from vinyl and magnetic closure. A telescopic frame will fit into any door and will make the process of installation much easier. With removable slide lock, you will be able to control when is the best time for your pet to go outside and play. When it comes to our beloved pets, we want to provide what’s best for them, right? One thing is for sure; with these products, they will be happier and healthier. It will also provide you some benefits as for them. You will be relieved of many duties, and your dog will be very grateful as well. Also, no more scratched doors. So, here are some benefits that will improve your pet and your life as well. Well, you will no longer have to play your pets doorman. Let’s face it; no one likes it when you have to open up the door for him hundred times of the day, and knowing how active dogs usually are you will surely need to. It takes away your time, and it is starting to get annoying. With this solution, you will no longer have to worry about it. If your dog wants to go to the bathroom, he can now go outside without you. You will no longer have to wake up at 6 a.m. just to take him out. When you are out of the home, he will no longer have to wait for you to go outside. It is very uncomfortable for them to hold it for a longer period. He can now go by himself and do his “business” while you’re away. Also, this will provide him a lot of fun. No dog loves to be left alone at home. But now he will have his key to freedom and can make the backyard his playground. He can use his door and explore the outside world of your home which is ideal for exercise as well. He can now run freely and play. That will help him to stay active and healthy. When your pet is bored, he will do anything to have fun. Even, when that is something that is not allowed to him. This causes some behavior problems. So providing them door to the outside world is the best solution for your furry friend. You will prevent these problems and your dog will be happy and healthy. This will also provide him some mental stimulation which will help to keep him alert. What is the best answer than freedom, to boost their confidence and improve their attitude? Safety comes first, right? If there are some unusual noises around the house, your pet could check it out and possibly scare off some intruders. Or if there are some extreme danger he can escape inside. If a fire starts in your home, your dog will have an escape way. This door will allow your pet to flee from any danger that occurs. Also for your dog safety be sure to check out our dog harness reviews. You will no longer have to worry about ’’mess’’ that your dog leaves after his bathroom time or play time. He can now do all that activities outside, which also means that your home will be cleaner and better scented. That means, no more accidents in the house. We need to take properly care of our pets. Purchasing this product, you will give your pet a life of freedom to freely comes in and out of the house. This creates a special bond and trust between you and your furry friend. There are different types of doors, with some unique features. Some of them are specially made for extreme weather condition, others for your large or small pets. This review will help you make a choice easier. After all, you know what is best for your dog.